If you know Audio-Technica, you know that this company doesn’t mess around when it comes to personal audio. AT is known for making high-quality headphones on par with rival products that are far more expensive. As great a value as Audio-Technica provides though, we still jump at the opportunity to save even more when the company’s headphones go on sale. 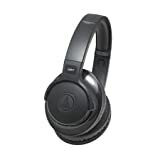 For a limited time, Amazon has slashed the price of the Audio-Technica ATH-S700BT SonicFuel Bluetooth Over-Ear Headphones to just $99. That’s a crazy value for a truly great pair of headphones, and it’s not going to last long.